Hello everyone and welcome to your virtual tour of Vienna! 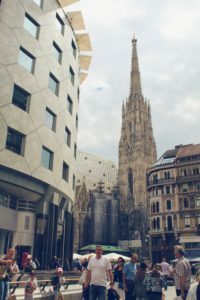 I’m totally kidding, but I hope through this post I can give you a taste of the tours we had today in Vienna’s city center. The MYO tour members’ day began at 7:00 AM or so for a breakfast buffet in the lobby. New types of breakfast including hot dogs, scrambled eggs with cheese and bacon folded in, and even better bread (craziness, right?) were served. My friends and I devoured breakfast and even got some really thick chocolatey hot chocolate from the coffee machine…I’m getting three tomorrow – let’s hope I don’t break the machine. After breakfast, we had a head count in the lobby and we were off to the races. A bus tour began our morning and we made our way throughout Vienna. Our guide pointed out important monuments such as Belvedere, Ring Boulevard, The Imperial Hotel, the Danube River Canal,the Vienna State Opera, Mozart’s Statue, the oldest ferris wheel in the world, and of course The Hofburg (former Imperial Palace). The bus made a stop at Belvedere to allow us to get a closer look. We exited the bus and made our way through the gates. We enjoyed the immense beauty of Belvedere palace and learned why the gorgeous building earned its name. In Italian, Belvedere translates most directly to “beautiful view”. When at the top of Belvedere’s north side garden, you can see all of the city below. Including St. Stephen’s Cathedral where our concert is tonight. We boarded the bus once again and headed into Vienna’s District One where the Hofburg is located. We had a brief outdoor walking tour of this area where we learned a few interesting facts about the former Imperial Palace. It was built in 13th century and has been a house of some of the most powerful people in European and Austrian History incorporating monarchs of the Habsburg dynasty, rulers of the Austro-Hungarian Empire. It was the principal imperial winter residence, as Schönbrunn Palace was their summer residence. Now, this spectacular palaces houses the President of Austria and their family and the Austrian National Library, State Hall. Currently, the Parliament is also housed in Hofburg as the Parliament Building is under renovation. The Austrian National Library is the largest library in Austria and houses the most extensive book collection in Europe. Including collections of old manuscripts, national treasures, and at least one copy of every book ever published in Austria. After our tour of the palace, we walked into City Center and got to pass by a very important monument for us musicians – Mozart’s house. During the 10 years Mozart lived in Vienna, he changed apartment buildings 14 times. His longest residency was at the house we passed by today in which he lived for two years. This means, in the other eight years he lived in Vienna, he must have moved between two and three times. No one is sure why he moved around so frequently. The most likely answer is money. Seeing Mozart’s house – even just from the outside – was awe inspiring but not as awe inspiring as what was to come next, St. Stephen’s Cathedral. The Cathedral towers above the city at the heart of Vienna. 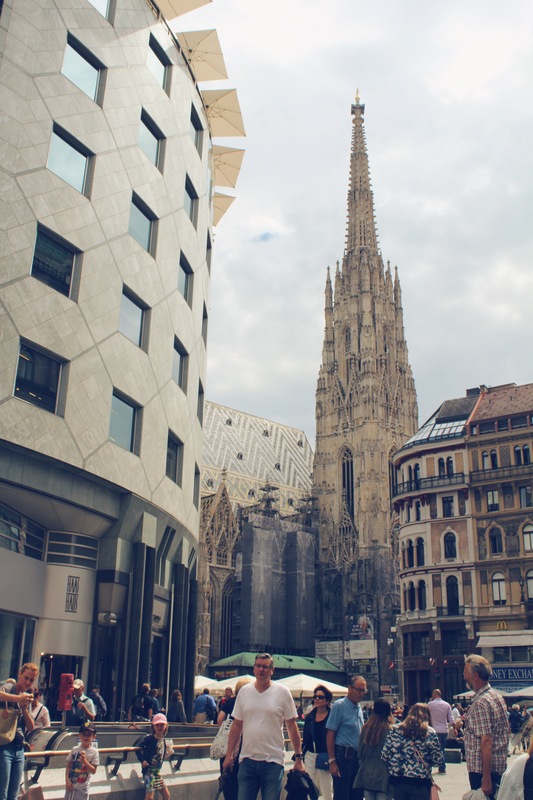 It reaches almost 450 feet at its highest peak, its gothic architecture stands among the other Viennese, the tiled ceiling makes a lasting impression, and its stained glass windows glisten in the sun. This is by far my favorite location on the trip and we’re singing here tonight. My hair stands up on end every time I think about it. We learn a bit about the Cathedral such as that Haydn and Mozart were married here, Mozart’s children were baptized here, the ceiling was burned during the second world war and replaced with the gorgeous tiles, the sandstone needs to be cleaned regularly due to its sensitivity to weather, and most interesting, the structure has been completed for over 500 years but has been a monument for almost 700. After learning a bit about St. Stephen’s from the outside, we were released for lunch. We were given an hour to explore and eat in Vienna’s city center. Soon enough, we met back up at St. Stephen’s for our rehearsal and waited to be escorted into the building. There were very strict rules and regulations during our sound check. Some of the most hated rules among the tour members included no hats, food, water, or talking. Tricky rules for most of us to comprehend let alone follow. The rehearsal went well. The hall was very different to sing in than most we’ve sang in before. As a choir, we cannot hear each other but the audience, especially those in the back, claimed we sounded like absolute cherubs. The orchestra was not able to set up in the center aisle of the cathedral like the choir had been. They required a side aisle. Overall, our rehearsal went well. As we walked the streets of Vienna back to our bus, we sang “Happy Birthday” to Makenzy Chaikin, Larry Davis, and Mr. Stickley’s daughter (via Facetime). Happy Birthday, again, to all! The buses brought us back to the hotel for some much needed down time after a long day of exploring. At 5:45 PM we headed out to the buses again and back into city center for a buffet dinner catered to us by the church. The food was delicious and definitely filled us up to be ready for yet another concert ahead. At 7:45 PM we made our way across the street and into St. Stephen’s. A quick sound check allowed us to get our bearings once more and we began the concert promptly at 8:30 PM. It was a full house. Almost every seat was taken and the audience had excitement so big you could see it on their faces a mile away. Our concert was an absolute success with gratitude and love for music booming through the Cathedral from every angle. Shoutout to Makenzy Chaikin and Elin Hu on absolutely stunning solos tonight. I would also like to recognize that Elin performed the clarinet solo in the orchestra’s concerto for our concert in Prague as well. Due to seating arrangements during the Orchestra’s performance, I was unaware of Elin’s debut performance. Currently, we are back at the hotel with a promising amount of rest to come. Can’t wait to share more about tomorrow’s journey with you after another wild day here in Vienna!